Mother's Day is fast approaching (Sunday, May 10) and Mom deserves more than a last-minute phone call, so send her a custom framed photograph that's ready to hang. Take 20% off with promo code Gawker20 at checkout. Whether it's a photo of you, the family, or a favorite childhood memory, you'll send the lasting gift of quality framing at a fraction of the cost. 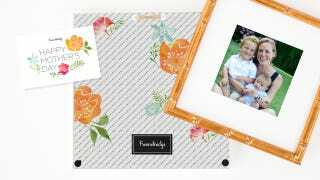 Framebridge is even offering limited edition Mother's Day floral backing and a gift note. Simply select Mother's Day gift packaging at checkout. Use promo code Gawker20. All content (photos/art) from Mother's Day orders must be received by Framebridge by Monday, May 4th to ensure delivery by Saturday, May 9th.